An Introduction, humble beginnings | JustRunLah! Having taken running more seriously recently, I chanced upon a variety of online platforms that catered to runners. I was pleasantly surprised to find out that JustRunLah! hosted a blogging platform for those who were interested. After a little contemplation, I indicated my interest to contribute. I began running when I was a kid. Most kids do indeed start to run by about 2 years old actually, so I’m sure this activity isn’t foreign to most of you reading this. However, I only ran to specifically get better at running back in 2012. Previously, having played competitive field hockey, I ran – but that was for the purpose of fitness. 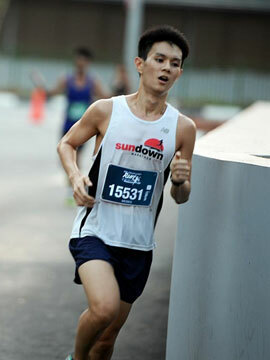 In 2012 however, I was introduced to running as an activity in itself. I’d say my running experience started with the participation of a race…though I didn’t quite train for it. Sundown Marathon 2012 (Full Marathon). Thereafter, I actually started a running blog, just to track my experiences. It’s been about three years and it’s interesting to take a look at what got me started. Below is an excerpt from the original post in 2012 (the rest of the blog can be viewed here). “My interest in distance running was inspired by a disappointing sporting season, accompanied with a simple suggestion by Ben, a friend from church, to participate in the Sundown Half-Marathon. The sporting season that ended abruptly left me feeling that an alternative avenue for the training to pay off came in the form of the 42.195km challenge”. I struggled through the adventurous challenge (recall that my friend suggested a half-marathon, though I wasn’t settling for anything less than best – that was before I knew ultramarathons existed!) but nonetheless completed it. At the finish, I fought back tears as strangely, something felt amiss. I had previously visualised the moment of finishing full marathon, yet I recognised this was not the end. Undeniably, this was an accomplishment, but I had unfinished business as I realised I needed greater motivation – a facet that transcended material accomplishment but one that really hit the heart, hard. Thus began my journey of running. There were various milestones that I set out to achieve and have attained thus far. Though often time goals, it is undeniable that the process grew me not just physically, but mentally and spiritually as well. Indeed it has been and I have faith that it will continue to be a fulfilling journey (of much more than a thousand miles).